Among the most confused and interchanged words in everyday parlance are contract and covenant. Most people, even preachers tend to throw the two words around rather loosely and use each in place of the other. The fact is, there is not a distinction without a difference, especially if such words are to be applicable in matters marriage. The concept of the word covenant has been applied throughout the Bible. Nevertheless, we do not use it in normal conversations as compared to the word contract. This is so because of the different applications of each word with contract taking the day more often. The most common misuse of the two words involves marriages. Quite often, we refer to marriage in terms of a contract rather than as a covenant. All the same, a differentiating boundary can be drawn to help change the way they are both taken to mean. A contract can be defined as a written and binding agreement between two or among several parties. The agreement can be in writing or oral and mostly concerns sales, employment, tenancy, and services. A contract can also be defined as a formal agreement for two parties to marry. This is usually referred to as a contract between a bride and bridegroom when they are joined in Holy Matrimony. Any contract signing is intended to be enforceable by the law of the land. 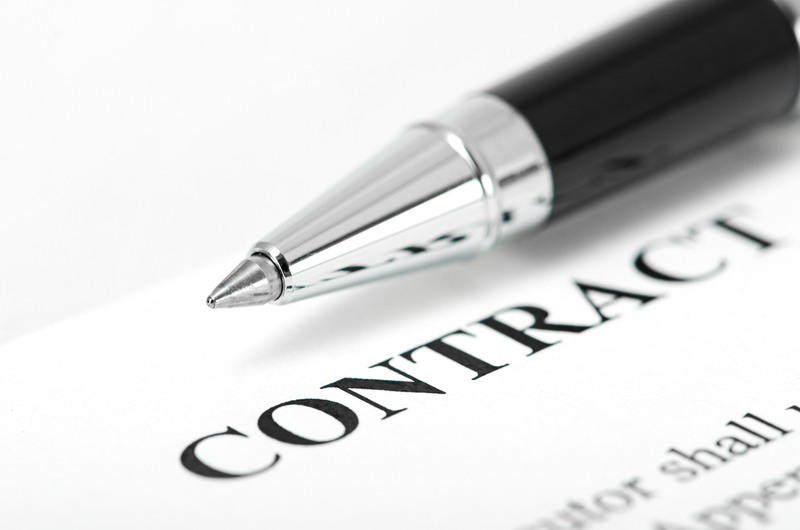 Several unique characteristics bring about the existence of a contract as listed below. Contracts are made for a limited period of time: – when a couple uses the phrase, “Till death do us part,” it is loosely translated by many as meaning, “We’re committing to being together until it is no longer fun.” After that, the marriage is hit by waves that eventually lead to its dissolution, most of the times. Must have an offer which must be accepted prior. Parties involved must have mental and legal capacities to enter the contract. Based on an “if…, then…,” mentality. Motivated by a desire to get something after signing it. Failure to getting the expected, a dissolution becomes inevitable. A covenant can also be defined as an agreement. Theologically, a covenant is an agreement that usually brings forth a relationship of commitment between God and His people. Examples of its application are the covenants made between God and Abraham, God and Moses, and God and David, all upon which the Jewish faith is based on. Covenants being initiated to benefit the other person: – if most people were honest enough, they would confess that they entered a covenant marriage to fulfill their deeper desire to benefit the other party. People making unconditional promises just like traditional wedding vows. Based on steadfast love: – a covenant relationship is built on steadfast love rather than by circumstances or feelings. Covenant relationships take commitments to be permanent. Covenant relationships involve confrontation and forgiveness. While the two terms may have some close similarities, there are fundamental differences between them. A contract us legally binding while a covenant is a spiritual agreement. 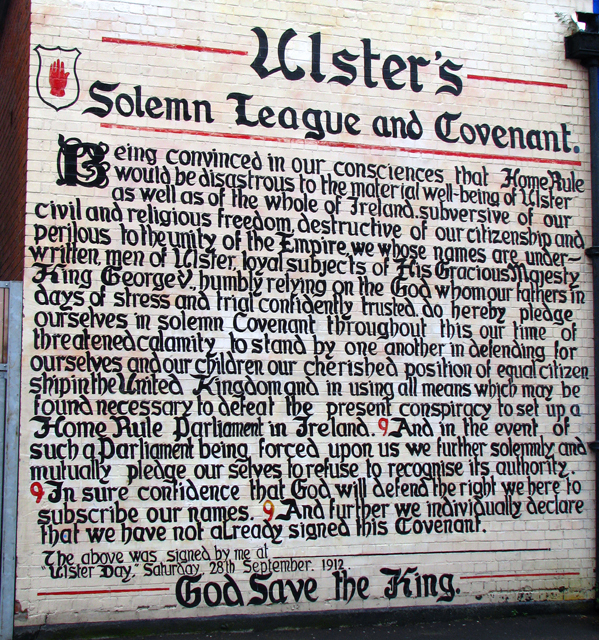 While a contract is an agreement between parties, a covenant is a pledge between two parties. A contract is canceled immediately upon failure by one of the parties to hold their end of the bargain. A covenant, on the other hand, is not based on either of the parties holding their end of the bargain. It is solely based on responsibility where one party continues to do what they had agreed to do regardless of whether the other kept their part or not. A contract is entered upon signing while a covenant is through sealing. A contract is an agreement that the parties can break and follow the procedures on the agreement for payments or compensation. A covenant, on the other hand, is based on a perpetual promise and, therefore, cannot be said to be broken or canceled. Even though the two words are confused and interchanged in place of each other, there are huge differences between them. The big difference is the nature in which the two are formed and the implications in case there is a violation of either. All in all, a covenant is a type of contract, but it does not work like one. It is a trust-based promise and relies on discipline, perpetual agreement, and integrity. Sarah Brown. "Difference Between Contract and Covenant." DifferenceBetween.net. November 26, 2018 < http://www.differencebetween.net/language/difference-between-contract-and-covenant/ >. I think you could benefit your readers by doing a bit more research into different types of covenant, such as parity covenants. I have read the work of others about different kinds of covenants, though I’m not an expert myself. Contract, Difference. "Difference Between Covenant And Contract". 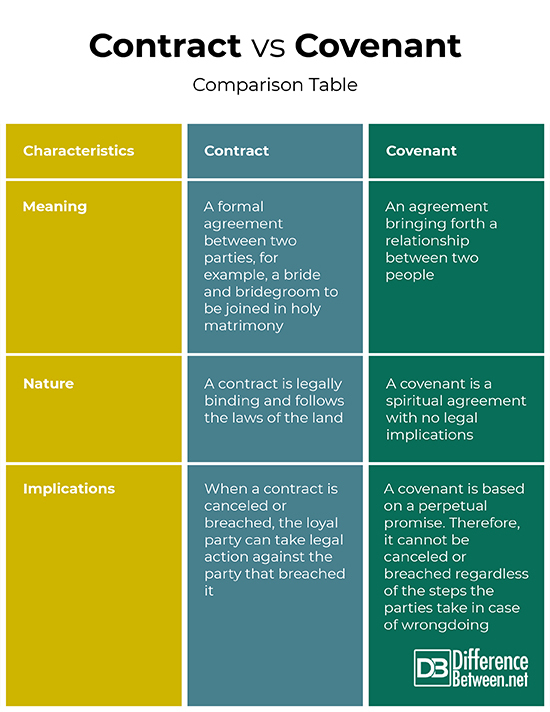 Upcounsel, 2018, https://www.upcounsel.com/difference-between-covenant-and-contract. Accessed 9 Nov 2018. Account, My et al. "Covenant People - Newcreeations". Newcreeations, 2018, https://newcreeations.org/covenant-people/. Accessed 9 Nov 2018. "What Is The Difference Between A Contract And A Covenant? | Marriage Counseling | United States | 24K Gold Marriage". Marriage Counseling | United States | 24K Gold Marriage, 2018, http://www.24kgoldmarriage.org/single-post/2017/05/11/What-is-the-Difference-Between-a-Contract-and-a-Covenant. Accessed 9 Nov 2018.